It may not seem like everybody's cup of tea, but the Manchester Museum of Science and Industry is a truly fascinating and varied collection of exhibits, displays and more, that will appeal to visitors of all ages. Fifteen different galleries crammed full of interesting items are housed in the key historic site of one of the world's oldest railway stations, Liverpool Road Station. Some of the permanent exhibits include the Revolution Manchester interactive technology gallery; the captivating Collections Centre with anything from antique microscopes to Star Trek memorabilia; a 4D cinema; and the Air and Space Hall. The Special Exhibitions gallery plays host to several touring exhibitions annually. The museum also houses a shop, café and restaurant, as well as several picnic areas. 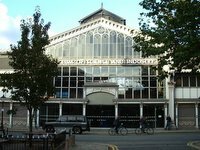 A highly recommended outing for the entire family, budget at least half a day to take in all the sights at the Manchester Museum of Science and Industry (better known as MOSI).